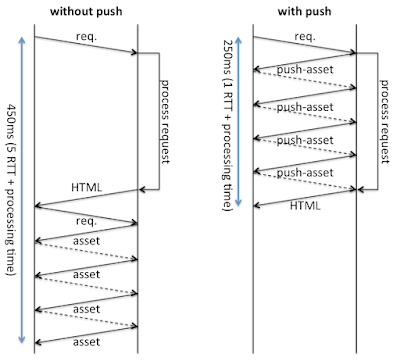 Push is a feature of HTTP/2, that allows a server to speculatively send response to a client, anticipating that the client will use the response. 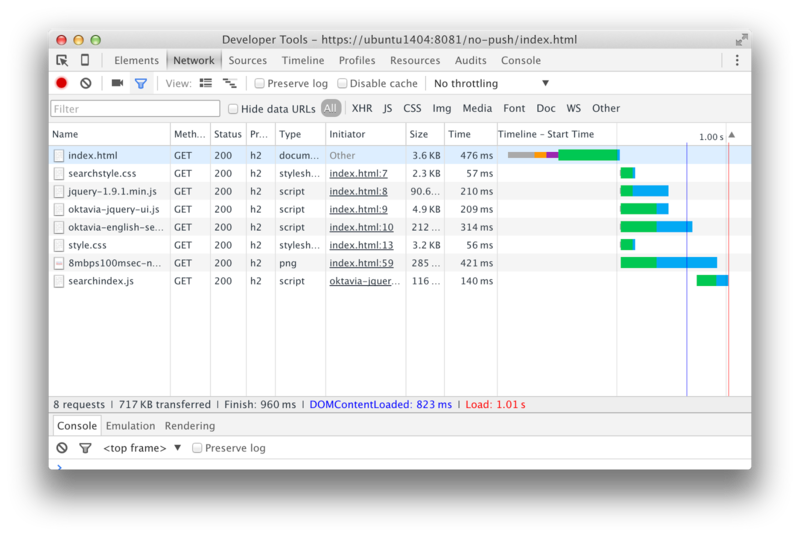 In my earlier blogpost, I wrote that HTTP/2 push does not have significant effect on web performance when serving static files from a single HTTP/2 server. While that is true, push does improve performance by noticeable margin in other scenarios. Let's look into one common case. Many if not most of today's web applications are multi-tiered. Typically, an HTTP request from a client is first accepted by an httpd (either operated by the provider of the web service or by a CDN operator). The httpd serves asset files by itself, while routing requests for HTML documents to application server through fastcgi or HTTP/1. It is when the response from the application server takes time that HTTP/2 push gives us a big performance boost. The chart below should be a clear explanation why. 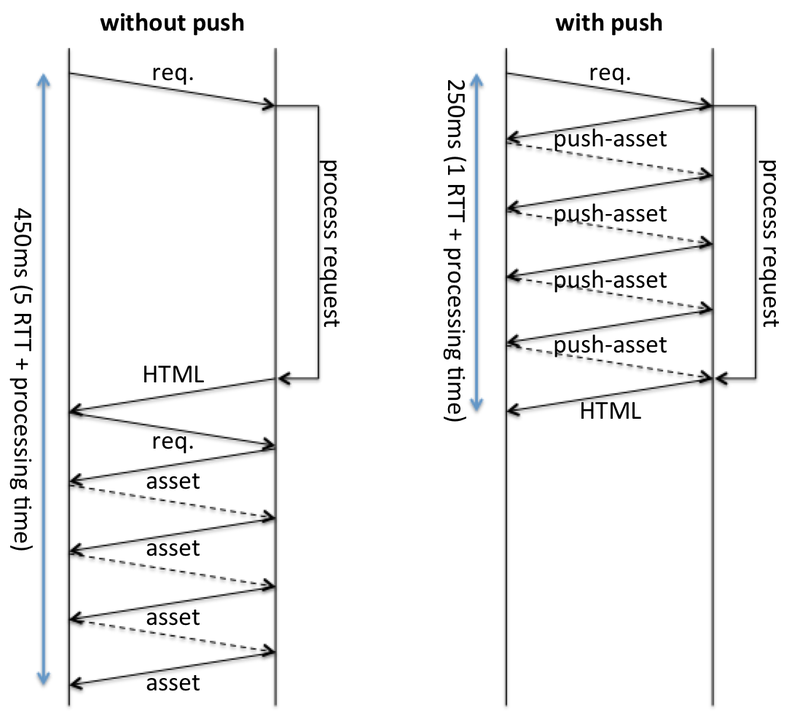 With HTTP/2 push, it has become possible for a server to start sending assets that are going to be referred from HTML, before the generated HTML is returned from the application running behind. It is not uncommon for an web application to spend hundreds of milliseconds processing an HTTP request, querying and updating the database. It is also common for a CDN edge server to wait for hundreds of milliseconds fetching a HTTP response from an web application server through an inter-continental connection. 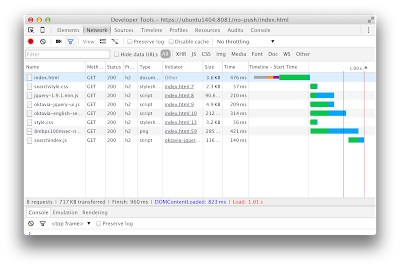 In case of the chart, RTT between httpd and client is 50ms and the processing time is 200ms. Therefore, the server is capable of spending 4 round-trips (or typically slightly above 200KB of bandwidth1) for pushing asset files before HTML becomes ready to be served. And thanks to push transactions, the connection will be warm enough by the time when HTML becomes available to the web server, so that the chance of the server being able to send whole document at once becomes bigger. The additional 1 RTT appears if HTML being delivered is small that it is incapable of growing the send window in the pull case. time_reducedmin is obviously zero, when no resource that can be pushed exists. Even in case you have a time window that can be used to push few hundred kilobytes of data, you would definitely not want to waste the bandwidth by pushing responses already cached by the client. That is why cache-aware server-pusher (CASPER) becomes important. Initially implemented as an experimental feature in H2O HTTP2 server version 1.5, CASPER tracks the cache state of the web browser using a single Cookie2. The cookie contains a fingerprint of all the high-priority asset files being cached by the browser compressed using Golomb-compressed sets. H2O updates the fingerprint every time it serves a high-priority asset file, as well as for determining whether certain asset files should be pushed or not. It should be noted that the current fingerprint maintained by the cookie is at best a poor estimate of what is being cached by the client. Without a way to peek into the web browser cache, we cannot update the fingerprint stored in the cookie to reflect evictions from the cache2. Ideally, web browsers should calculate the fingerprint by itself and send the value to the server. But until then, we have to live with using cookies (or a ServiceWorker-based implementation that would give us freedom in implementing our own cache3) as a hacky workaround. Let's move on to an experiment to verify if the theory can be applied in practice. For the purpose, I am using the top page of h2o.examp1e.net. The server (H2O version 1.6.0-beta2 with CASPER enabled; see configuration) is given 50ms simulated latency using tc qdisc, and a web application that returns index.html with 200ms latency is placed behind the server. Google Chrome 46 is used as the test client. Next two figures are the charts shown by the Chrome's Developer Tools. In the former, none of the responses were pushed. In the latter, blocking assets were pushed using CASPER. As can be seen, both DOMContentLoaded and load events are observed around 230 msec earlier when push is being used; which matches the expectation that we would see an improvement of 200 msec to 250 msec. As shown in this blogpost, cache-aware server push can be used by a reverse proxy to push assets while waiting for the backend application server to provide dynamically generated content, effectively hiding the processing time of the application server. Or in case of CDN, it can be used to hide the latency between the edge server and the application server. Considering how common it is the case that the processing time of an web application (or the RTT between an edge server and an application server) is greater than the RTT between the client and the reverse proxy (or the edge server in case of CDN), we can expect cache-aware server push to provide noticeable improvement to web performance in many deployments. EDIT: This blogpost is written as part of the http2 Advent Calendar 2015 (mostly in Japanese). It is customary in business endeavors that have beginning late entered the information trades industry to suggest a computerized master as an IVR. Even marketing has been revamped for business promotion, now-a-days there is no longer the yellow pages or word of mouth referral that is being practiced, rather, SEO has emerged as game changer for many business houses. Mother’s Day is celebrated for our family most special person our mother. Mother is a god gift for all people in the world. Every son/daughter is celebrated Mother’s Day for their mother; they express their feelings, love, and joy with their mom. Mother’s Day is celebrated in all over the world on different days; Fathers Day Quotes from Wife it means Mothers Day Date is not same in all over the world. In most countries, Mother’s Day is celebrated second Sunday of month May. Mother’s Day was first celebrated in 1908 when Anna Jarvis held a memorial for her mother at St Andrew’s Methodist Church in Grafton, West Virginia. mothers day wishes St Andrew’s Methodist Church now holds the International Mother’s Day Shrine. I have never seen httpd, sounds strange. Google bases their rankings on how useful a page is for the query a user has entered, plus the utility of the site - for example, can a user complete the action they would like to? I want to share you useful article about cost to develop a mobile app , hope you can find very informative facts. Very informative post! Keep sharing more such posts. I'm glad that I came across your article. Looking forward for more from you.